Juvenile wood frogs emigrating from their birthplaces in vernal pools into the terrestrial ecosystem may transfer mercury they accumulated during larval development into the food web, according to a team of University of Maine researchers. The team, led by U.S. Geological Survey and UMaine wildlife ecologist Cynthia Loftin, conducted its study at four short-hydroperiod (likely to dry by mid-June) seasonal woodland pools in Acadia National Park on Mount Desert Island, Maine. The researchers found mercury levels in the 1- to 2-week-old embryos were near or below detectable amounts, indicating that transfer of mercury from mother to eggs was absent or minimal. 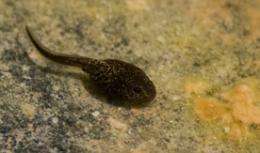 However, mercury accumulated rapidly in the 6- to 8-week-old tadpoles. Mercury, a heavy, toxic metal, occurs naturally and is introduced into the environment by metal processing, coal burning and mining. People are exposed to mercury by eating contaminated fish and wildlife. Over time, low-grade mercury exposure in people can impact cognitive thinking and fine motor skills. While concentrations of total mercury differed among the pools and were greatest in the unburned softwood-dominated setting, the levels increased in all pools throughout the season. The pools dried in June and refilled with September and October rain. Wood frogs can travel some distance from their natal pools. During summer, fall and winter, they live in wetlands and on land. In the winter, they hibernate underneath leaf litter, woody debris and soil. They return to pools in the spring to mate. For a better understanding of the transport of this contaminant from seasonal pools into the surrounding environment and potential for uptake into the terrestrial food web, future studies should focus on the ratio of total mercury to methylmercury (produced by burning of fossil fuels) in embryos, tadpoles and juvenile frogs leaving natal ponds, according to the research team, writing in the journal Northeastern Naturalist.